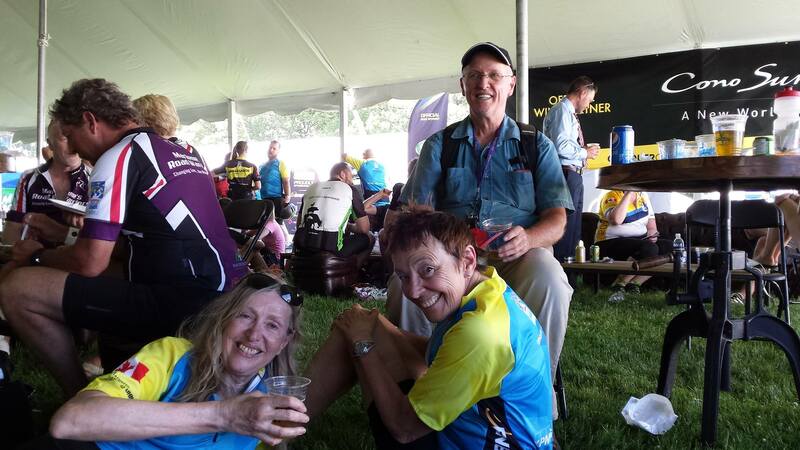 Just completed my 9th Ride to Conquer Cancer, a 213 km marathon charity bike ride from Toronto to Niagara Falls via Hamilton. The Ride is the biggest fundraising success story in Canada. This year over 4000 cyclists raised $17+million for the Princess Margaret Cancer Research Centre, which has spear-headed individual cancer therapy. My friend, Andre and I did the inaugural Ride in 2008 and it had by far the best spirit. People rode everything from carbon fibre racing machines to old clunkers pulled out of the garage. No cops doing traffic: instead we relied on a friendly motor cycle club. Road signs got lost or misplaced. The route was tres hilly, too. I remember falling into bed at 6 pm, completely exhausted after finishing that first day. Since then, every year never fails to be an adventure due to the vagaries of weather or the misadventures of crazy cyclists. This year was no exception. 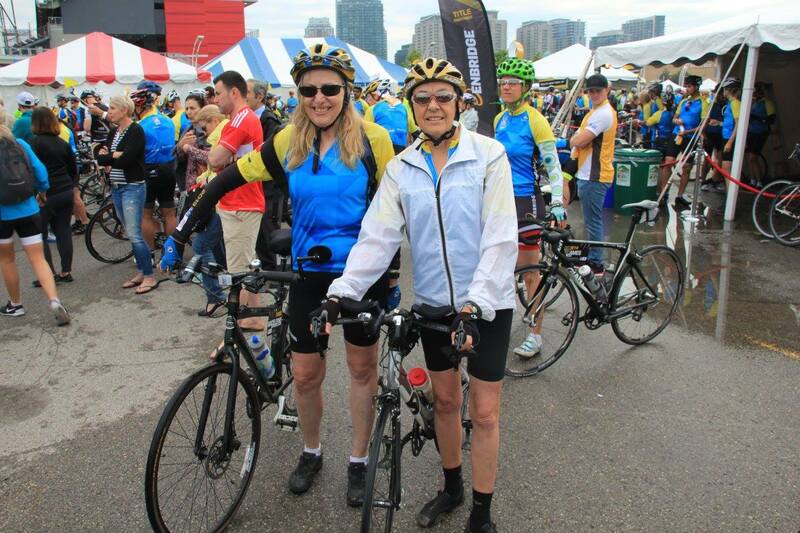 Here you see me and my buddy, Marci, at the start of the Ride in Toronto. (That’s me on the left.) We were worried about the predicted thunderstorms hence the rain gear. Instead we got major crosswinds that threatened to blow us off the road as we struggled up and down a hilly course in 35 degree weather (that’s 85 Fahrenheit). Almost impossible to avoid serious dehydration: I downed 2 litres of Gatorade en route! We did get our reward at the end of Day 1 though: 15 km of speedy downhill to the McMaster University finish line and two beers each! To be shared with our faithful husbands and support crew. Day 2 dawned clear and much cooler. The wind was behind us and we pumped our way through 119 km of undulating wine country. Beautiful! Riding with 4000+ cyclists is hazardous. We saw 3 accidents involving 3-tiered response with wailing ambulances. 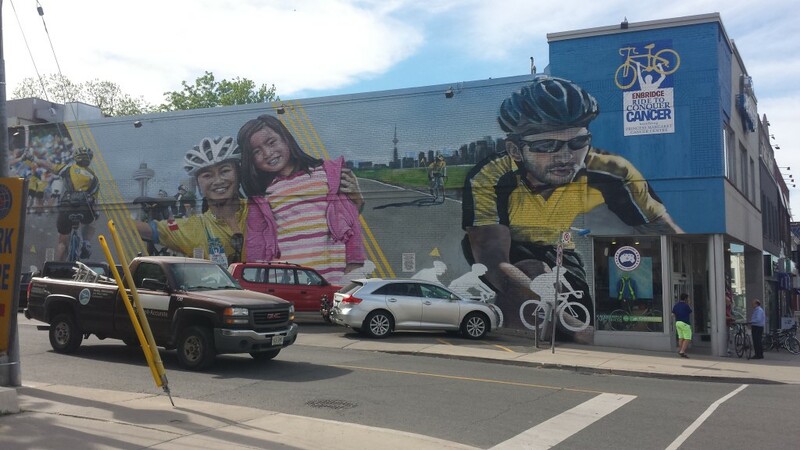 The compulsory safety video doesn’t sink in for many participants who freewheel down hills at 30 MILES per hour, pass too closely and indulge in forbidden drafting. Many participants sported road rash or suffered bike breakdowns. Fancy road bikes do not fare well on rough, pot-holed roads. Elite cyclists may despise my faithful hybrid, which is slow on hills, but it’s rugged and has held me up through thousands of kilometres. Next year will be the 10th anniversary of the Ride. Did I sign up? Sure! And so did Marci. More adventures to be had in defeating this horrible disease!